We welcome contributions to the seL4 project sources. For contributions to this documentation site, please see our docs contribution guidelines. If you would like to make significant changes to the seL4 kernel, or any of its libraries, consider making an [RFC RfcProcess]. This will allow seL4 developers and the wider community to comment and approve of your design. That you give us the rights to use your contribution. Figure 1 illustrates the contribution process. 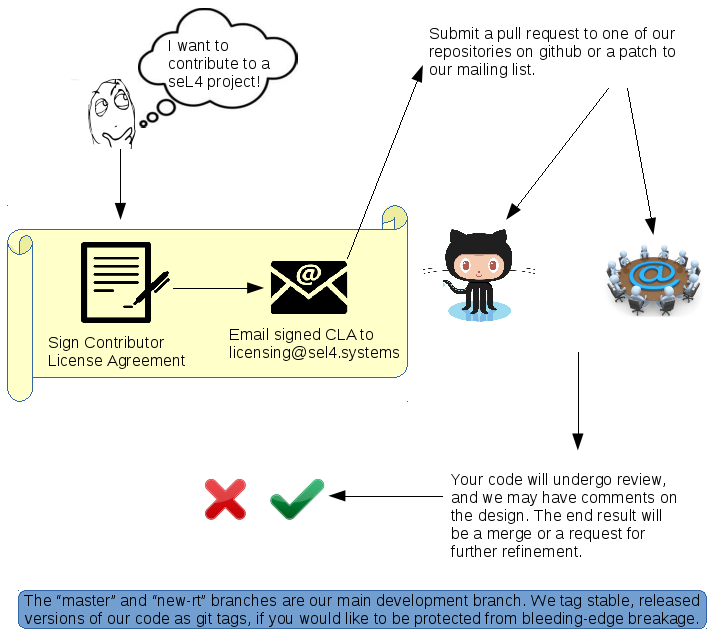 Once your pull request is approved, it will be merged internally and pushed out to github. See Suggested Projects for suggestions on where to contribute.